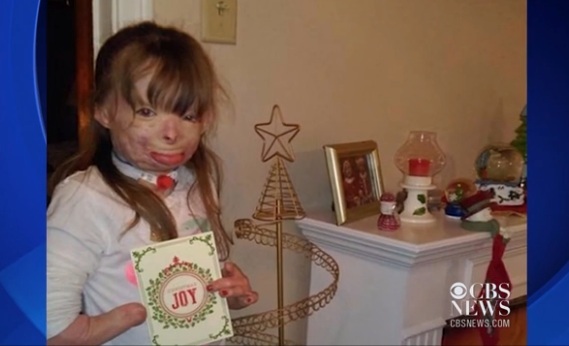 ROTTERDAM, N.Y. -- A little girl who lost her family and suffered disfiguring burns in an arson fire is having an incredible Christmas, thanks to the generosity of thousands of strangers around the world who were moved by her simple Facebook wish. "This year's been magical, amazing," said Liz Dolder, who posted a picture of her niece, Safyre Terry, on Facebook earlier this month. The post showed Safyre with a Christmas card tree Dolder got at a thrift store, and said the 8-year-old hoped to get enough cards to fill it. "I haven't found a word in my vocabulary to describe what has happened," Dolder said Wednesday. Kevin Clark, a member of a motorcycle group who met Safyre at a benefit bikers held for her this fall, reposted the picture. Before long, it had been shared tens of thousands of times, and cards and gifts started pouring in from across the United States and overseas. Another friend put a post on the YouCaring.com crowdfunding site with a $15,000 goal to help Dolder and her husband, Mike -- Safyre's new family -- deal with medical costs and other financial challenges. More than $174,000 has been donated since the Christmas card post went viral this week. On Wednesday, Safyre opened some of the hundreds of cards and gifts that had arrived at a post office box in a local mall. There were teddy bears, stuffed kittens, handmade jewelry, personalized Christmas tree ornaments, whimsical socks, books and cards signed by whole classrooms of schoolchildren. Safyre opened a silver box with a card that said, "Every princess should have a tiara. Here's yours," and then skipped to Dolder to show her the shiny rhinestone tiara, saying "Look, Mom!" Dolder said Tuesday that Safyre was "over the moon" when the first card arrived. But Dolder said the family was unlikely to receive enough cards to fill the card tree. That has obviously since changed. Safyre has endured much since the awful day in May 2013 when firefighters found her clutched in the arms of her dying father, who had shielded her with his body and saved her from the flames that killed him and Safyre's three younger siblings in their apartment in Schenectady in upstate New York. She has had countless reconstructive surgeries to rebuild her mouth, nose and face. She eventually lost a hand and a foot to repeated infections. But her spirits lifted considerably last January when a tracheal tube was removed and she was able to speak again. "That's when she came back out," Dolder said, wiping away tears. "She's been through hell and back. But she's an amazing girl, just so full of life and love. We can't keep her to ourselves. We wanted to share with the world her message of faith, hope and love." Safyre, with long sandy hair, pink leggings and glitter-spangled sneakers, showed not a hint of self-consciousness as TV cameras pressed in to record her opening gifts and cards Wednesday afternoon. Asked by reporters what she would say to the strangers who had been moved to send these things, she beamed into a camera.